Happy St. Patrick's Day Everyone!!! 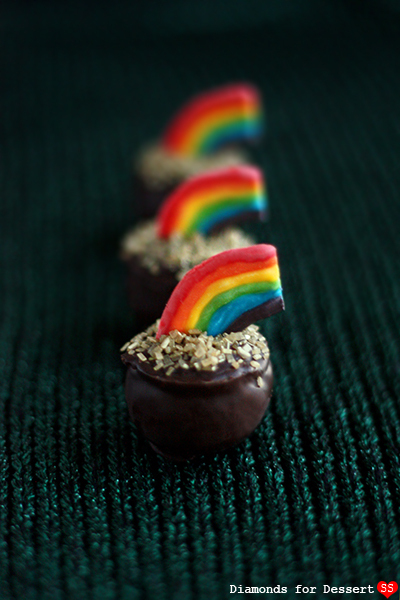 For today, I gave my Bailey's Truffle recipe a festive twist, giving them a bit of gold sparkle and rainbow color. I decided to use the same recipe as the Bailey's Bear Truffles, since I thought the Irish Cream would be perfect for St. Patrick's Day. 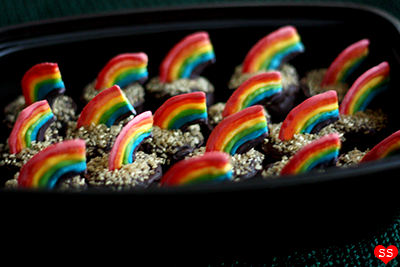 If you're a long time reader of this blog, you might remember my Pot of Gold Cupcakes? Well, this year, I thought I would take the same idea and adapt it to truffles, since decorating truffles seems to be my new obsession. 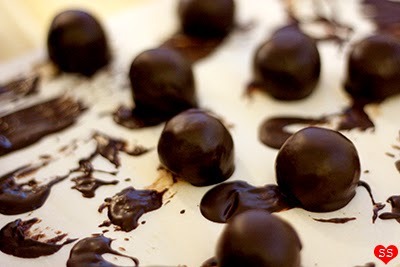 Make the Bailey's truffles recipe. Let chill in the fridge for a few hours, or until firm enough to work with. Melt the white chocolate. Split it between 3 bowls. Tint one of the thirds red, one blue, and one yellow. In a separate bowl, start with yellow and slowly add a little red at a time until you get the orange you want. In another bowl, start with yellow and add a little bit of blue until you get the green you want. Lastly, in another bowl, start with red and slowly add blue a bit more at a time until you get the purple you want. Now you should have 6 shades of colored white chocolate: red, orange, yellow, green, blue, and purple. Place the different colored chocolates into separate ziplock bags. Cut off a tiny bit of the tip of a corner of the bag of red chocolate. Squeeze an arc of red on a piece of parchment paper on a flat surface. Repeat until you have about 24 arcs (extra in case you mess up). Next cut off a tiny bit of the tip of a corner of the bag of orange chocolate. Squeeze and arc of orange right each arc of red chocolate (they should be touching). Repeat this with the yellow, green, blue, and purple bags of chocolate. 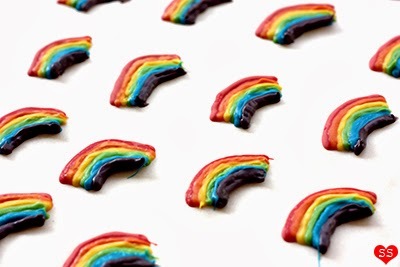 Let your chocolate rainbows totally dry/harden before using. Once dry, carefully peel them off the parchment paper. Feel free to take a sharp knife to trim the two ends of the rainbow if they're messy. 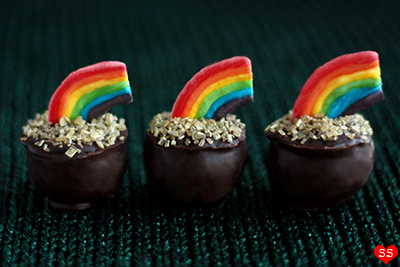 While waiting for the rainbows to dry, you can shape the truffles. Scoop the truffle mixture out of the bowl and roll it into 18 balls (I like to split the mixture into two. Then split each half into thirds. Then split each third into thirds to get 18 almost even sized blobs of truffle mixture.) 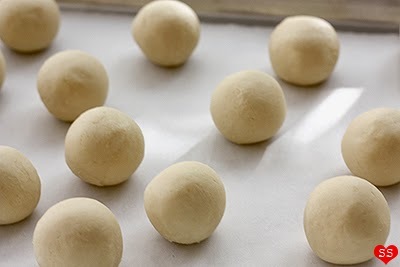 Place the balls onto a cookie sheet covered with parchment paper. Let chill in the fridge until firm. Once firm, take the balls out of the fridge. The side of the balls touching the cookie sheet should be slightly flat (this side will be the bottom of the pots). Take a knife and slice a bit off the top of each ball (this will be the top of the pots). 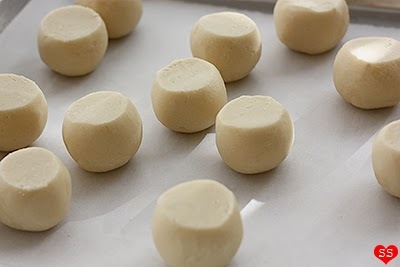 The sliced off portions can be rolled up into another truffle (that's how you end up with 19 truffles, instead of 18). Place the truffles back in the fridge to firm up a bit. Melt the semisweet chocolate. Dip all the truffles in the chocolate, shaking off the excess chocolate, and place each truffle on a piece of parchment paper on a flat surface to dry, with the "tops" of the pots touching the parchment (the larger flat side should be facing down). Let the truffles dry/harden before proceeding. Once the truffles are dry, peel them off the parchment and flip them around. Take some melted chocolate to patch up any holes/bald spots. Then use a toothpick to spread some melted chocolate to the top of each truffle. 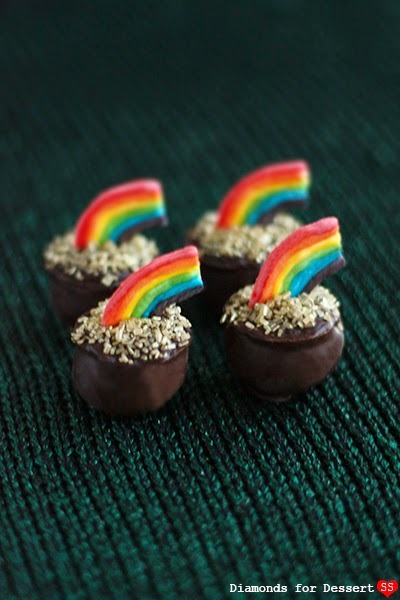 Press a white chocolate rainbow into the center of each truffle. Cover the rest of the top of each truffle with gold sprinkles. Let dry before serving. (If not serving immediately, keep refrigerated. Let reach room temperature before serving). wow they are so cute, perfect for st pattys day!